Faced with a major trouble switching bodies and said Troubled person running around switching people – Nathan and Duke decide to talk about Mara and Audrey. Of course they do. Duke in Nathan’s body brings Dwight in Gloria’s body up to speed with everything. Duke and Nathan also have another problem – Duke is due to let out a Trouble or he explodes, killing everyone. They decide they can release a Trouble without Mara but they need to pick a safe one; they fixate on a “Reincarnation” Trouble which makes people live past lives (how can you have such a major, revelatory Trouble and just sweep it away like that?!) which, of course, they hope to use on Mara to bring Audrey back. When Vince/Dave started asking questions Jeffrey (in Skip’s body) panicked which set his Trouble off – both of their Troubles off – since they’re connected. The solution that they see is getting Jeffrey and Skip together to resolve their issues. They lure her into asking to have the stun belt removed – proving it’s really Mara; they lock her up and Nathan cuts Duke’s hand to release a Trouble. It doesn’t go to plan, not only can Nathan not release a Trouble, but when orderlies arrive to Mara’s screaming she tells them Duke (in Nathan’s body) attacked her and uses Audrey’s ID to have them restrain Duke – who can’t prove he’s really Haven PD because, of course, he isn’t. Nathan and Duke end up locked up. In North Carolina, the Teagues find that Jeffrey (in Skip’s body) can’t fix the switch he does need to speak to his brother. He’s not a fan of that idea but he agrees after Vince/Dave is nearly sucked into the Thinnie that is randomly in his garden. On the drive back, though, Vince (in Dave’s body) has a vision – seeing a man run from something, carving Croatoan on a tree just before whatever’s chasing him catches him, grabs his head and pull black smoke from his eyes (looks like Aether, which Mara uses to power the Troubles. This is where it comes from?) unfortunately, he’s driving so he crashes. 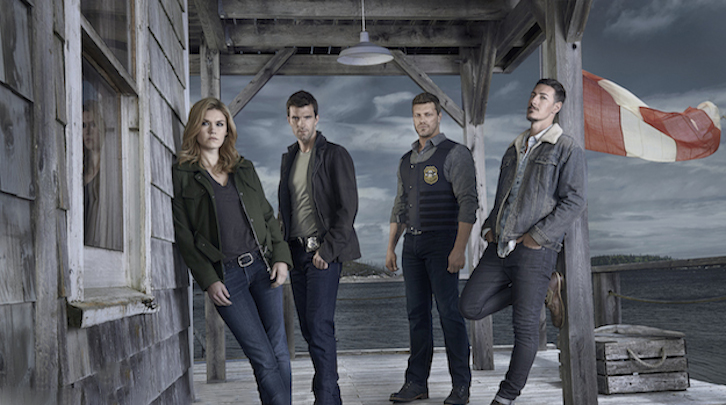 In Haven, Gloria (in Dwight’s body) is taken to hospital and Dwight, Nathan and Duke confirm that the reason Mara kidnapped Jeffrey is because the Troubles inside Duke seem to skip the usual immunity Mara enjoys – and since they need to switch back to release a Trouble, she’s trying to stop that happening. Vince is in hospital but seems ok – and everyone gather for the brother reunion. They greet each other with hugging. Hugging de-switches everyone. Everyone back to normal but the Teagues stay on topic and discuss their visions. Alison also joins them – she knows about the Thinnie outside the house; her family have been looking over them since the 16th century, the original Roanoke colony. Her family legend says before the colony arrived, the Native Americans said the area had a menacing green mist (which Dave and Vince have seen) and even the Native Americans found the colonists had vanished – and they lost time. They also have Alison look at Dave’s adoption file which still shows he was adopted from her house, implying her ancestors. She recognises Agent Howard –who tried to buy her house from her mother (which also further proves Agent Howard never aged). Gloria and Dwight have their own little meet up now they’re in their own bodies – and they address the secret they’re keeping (they wouldn’t have switched if they didn’t have a secret). Gloria knows where Dwight’s apparently estranged sister is. Her bullet magnet Trouble activated – and she died. The Teagues do their own secret digging – Dave remembers losing time before, when the Colorado Kid died (previous season, Audrey/Mara’s son). He remembers being pulled into the void and waking up on a beach – next to the Colorado Kid’s body. And to Nathan, Duke and Mara – Nathan is at the end of his tether and threatens to kill Mara if Duke dies from his Troubles – because if Duke dies then there’s no Audrey left. It’s all irrelevant anyway because Duke releases a Trouble – it’s shiny and explosive and has big dramatic music. His explosive Trouble releases Audrey… a second Audrey. Mara’s still around but now Audrey is as well. Yes, in separate bodies. Wait wait wait, let me get this straight – he was cheating on Alison so Alison and Jeffrey switched his body, convinced him he was insane and dumped him in a mental institution in another state then went on to live their blissful life together? Seriously? Why has no-one told Alison and Jeffrey that they may be the worst people ever? Speaking of dodging morality – if Mara let’s Duke die there’s no Audrey left? Poetic. Except Mara has directly, outright murdered someone. I’m not talking ramped up a trouble and let it kill people, but shot someone and killed them for car keys. Not helping Duke would show Audrey is dead but murder wouldn’t? I’m actually really happy with how they brought Audrey back because of my repeated worries about trying to brainwash Mara when she is the original personality. Changing Mara back would always be dubious – creating a separate Audrey is far more palatable. I’m glad it’s done now – because the Teague’s are brewing up a big and deep mystery and we keep getting distracted. On topic now! I suppose with body-switching episodes it’s a chance for everyone to flex their acting muscles – and it was decent. Not amazing or shiny – but then, that understated acting elements of each other’s characters was definitely the way to go.